Now that Theranos is allegedly/denying-trying to raise money, speculations continue as to whether it could survive the Wall Street Journal article, Hot Startup Theranos Has Struggled With Its Blood-Test Technology, or whether a big industry player may swoop down to acquire the company. In terms of “who would be audacious (to use a polite word) enough to possibly merge/acquire Theranos”, I think a diagnostic company would be more a likely candidate… you know, one of the big players that Theranos was meant to “disrupt” the business of. The short sighted assumption from many people thus far, is that Theranos was the only company that had the “foresight” to reduce sample volume required for blood based assays. Can we actually believe that NONE of the big players NEVER considered the competitive advantage of reducing sample volume required from patients and human subjects? Are we saying that all these years no one had ever realized how many people hated needles, and the kind market leadership position one may gain if one creates an assay method that enables accurate sampling of mere drops of blood versus vials of blood? The best performance in the graphic from Theranos in terms of “accuracy” compared with a hospital result “standard”, is the glucose test. This is nothing to be impressed about: getting the glucose reading right is no newer than the finger prick glucose draw available from today’s diabetes management devices. It only shows Theranos got their tech as right as what is already available in terms of a finger prick blood sugar test. Perhaps someone can use current glucose monitoring technology, modify it so it could assay for Herpes (simplex type1), and see if the same “tech” transfers readily to accurately test for Herpes. This would offer an interesting data point to show just how novel the “Edison portfolio of technology” is. This one graphic sums up the Theranos problem: the most accurate comparison is in a variable for which cheap and accessible diagnostic is available (glucose), and not for any variables for which wide clinical use are expected (liver function tests, which are critical for a variety of medications affecting liver function). 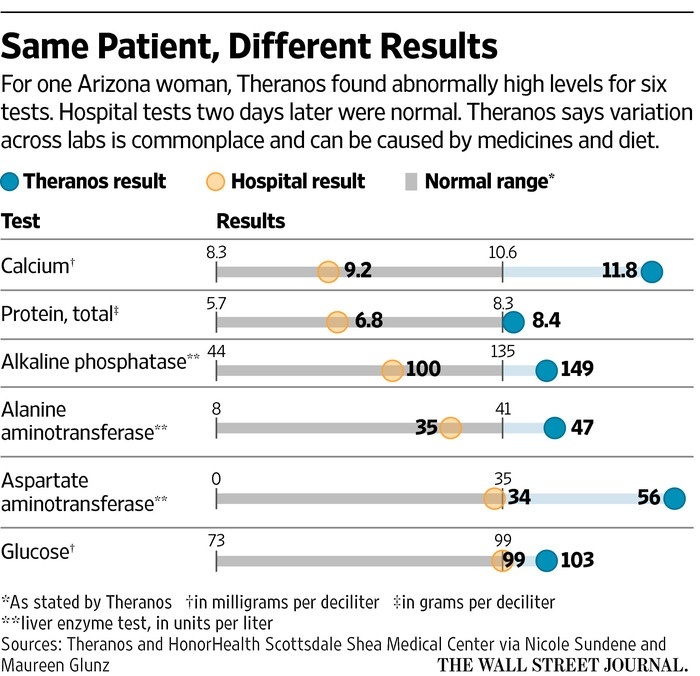 Theranos’s results are consistently “false positive” compared with hospital standard: if a clinician believes in the Theranos result, the clinician may order the patient to stop taking medications that the patient needed and was doing well on, but should no longer be taking because the results show that liver was being negatively affected, or the clinician could switch to another less effective medication for the patient out of concern for liver function. Either case, if the Theranos test was inaccurate, this would cause harm to the patient by unnecessarily disrupting treatment regimen that was otherwise appropriate. This is not the kind of “disruption” healthcare providers want. From a business perspective, Theranos’s FDA approved use for its product has a very narrow indication (Herpes), yet the test is commercially available without authorization from a licensed healthcare practitioner. This is great for the company’s bottom line, because the (federal) agency will have a tough time identifying which kits have been purchased for “approved” use and which kits are actually used “off-label”. The pricing advantage allows Theranos to reduce dependence on CMS reimbursement, by going straight to consumers. Liability becomes a matter of personal injury, which may be skirted when the consumers assume entire risk by “inappropriately using” the kit. However, this is not great from a consumer protection standpoint. We may subscribe to a conspiracy theory about major diagnostic and device companies colluding to keep an oligopoly on expensive assay machines and profit margins for assay kits, but from a business competition standpoint, the market dominance/leadership would be too attractive for a major player to ignore in the name of market oligopoly.